Hydrodynamic problems that involve a wide range of scales (i.e. turbulence or combustion) can often not be simulated to acceptable accuracy with static discretizations. In order to concentrate the computational resources on the relevant solution regions and to increase the resolution only locally, several dynamic mesh adaptation techniques have been proposed. In this talk we focus especially on hierarchical blockstructured methods for finite volume discretizations. After a general overview, the structured adaptive mesh refinement (SAMR) algorithm after Berger and Colella will be described. 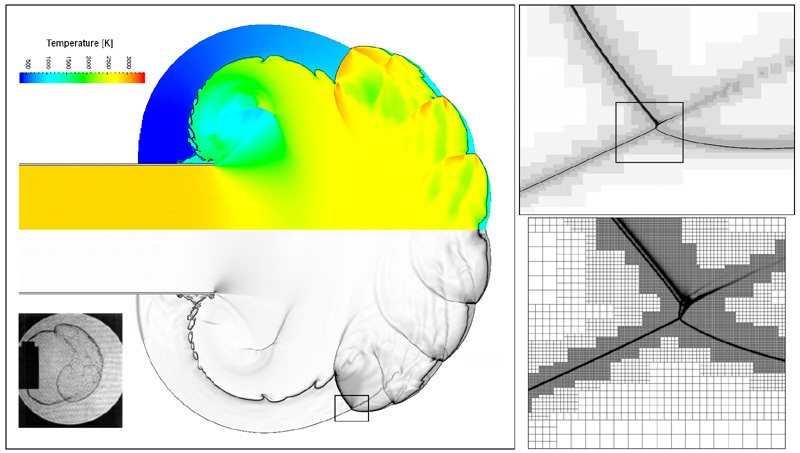 The algorithm is tailored for instationary simulations of hyperbolic conservation laws with time-explicit schemes and several highly resolved SAMR calculations for Euler equations will be shown. In particular, multi-dimensional detonation simulations with detailed hydrogen-oxygen chemistry will be used to demonstrate the high efficiency of this approach. In the second part of the talk the adaptive multigrid methods after Brandt and McCormick will be introduced as effective iteration schemes for globally-coupled implicit discretizations on dynamically adapted blockstructured meshes. As a model problem self-adaptive simulations for the Poisson equation will be shown. The overlap between computational codes for adaptive multigrid and SAMR is large and we discuss the few changes necessary to supplement our framework AMROC (Adaptive Mesh Refinement in Object-Oriented C++), which was originally developed only for hyperbolic SAMR, with a multigrid component. In contrast to other implementations AMROC uses a rigorous domain decomposition strategy to partition the entire hierarchy from the base level on. The approach naturally reduces the communication costs and is in particular well suited for distributed memory machines, i.e. Linux-Beowulf-clusters. The last part of the talk outlines the embedded boundary representation technique that will be used to incorporate moving boundaries into AMROC to allow coupled fluid-structure simulations required by CalTech's DOE ASCI Center. Planar simulation of a hydrogen-oxygen detonation 240 microseconds after leaving a diffusor with critial diameter. Left: qualitativ comparison of simulated schlieren graphic with an experiment (lower left). Right: hierarchical grid adaptation around a triple point (top) and employed finite volume triangulation (bottom).